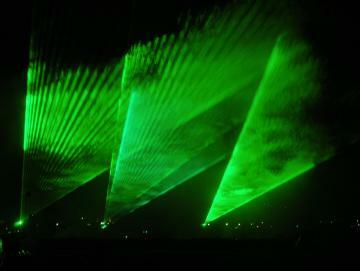 The 2nd Edition of the European Laser Show Festival will take place in the city of the Cap d'Agde (south of France - close to Monptellier) from the 23 to June 26, 2004. Leading European laser companies will present their shows. Laserforum (the Netherlands), LM Productions (United Kingdom), HW Lasertechnik (Germany), Laser Entertainment (Italy), Global Laser Systeme (Austria), Laser System Europe (Belgium), LPI (France), Omicron (Poland) and Art Screen Multimedia (Russia) will be joining the festival 2004. In 2002, 15 000 people watched the shows at the Bay of St. Tropez. In 2005 there will be a World Cup Laser Show with companies coming from all over the world. © 2000 © 2004 Pro-Light-News. All rights reserved. Thank you for visiting Pro-Light-News.